For our second stop in the Burger Club exploration we picked up two more attendees and headed over to Herb & Thelma’s Tavern in Covington. To say this was a change from our first stop would be an understatement. If you are looking for a wide selection of cheeses and creative toppings, this is not the place for you. To even describe this place as unpretentious seems a little too pretentious. 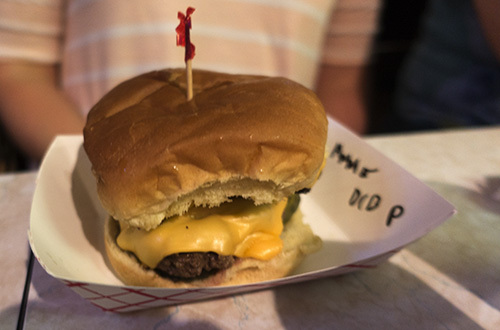 This is a no-nonsense bar that serves hamburgers, but is it any good? Let’s Find out. 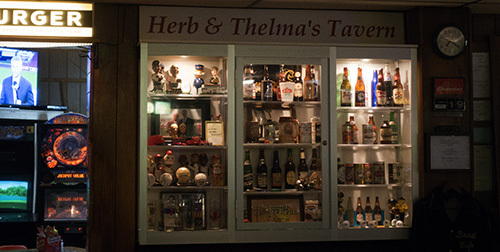 Herb & Thelma’s oozes history. 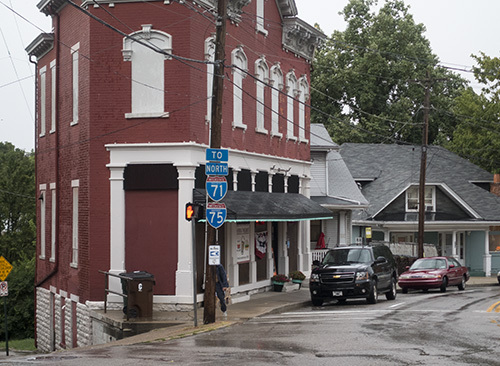 It is an old building on Pike Street, and has been around since 1939. It was owned by one family until just a few years ago, and was recently sold for the second time in January. It is easy to miss on the curve on Pike Street, and I only know about because a friend told me about it years ago. There is not a lot of presence on the street, and the door can be intimidating, but once you walk through you find a time capsule. You know those places that like to create that fake old look with lots of objects, kind of like Cracker Barrel. This is one of those places they are trying to imitate. The tavern has two rooms, and plenty of old beer signs and other mementos. 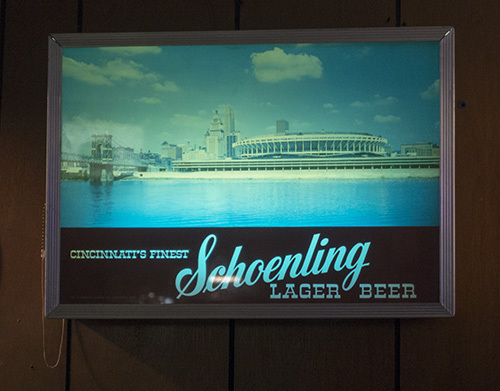 A classic example was this group favorite, an old Schoenling sign with the Cincinnati skyline from the 70’s. Not to mentions the cabinet with old bottles, cans and memorabilia. You’ll notice the second room has a pinball machine and video game. But as fun as the ambiance is, we didn’t come her for the local color, we came for the burger. Toppings american cheese, pickles, sliced onion, mayonnaise. 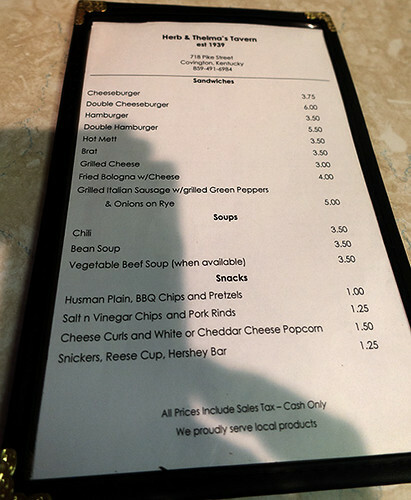 Herb & Thelma’s menu is divided into 3 sections. Sandwiches include hamburger, cheeseburger, hot mett, brat, grilled cheese, fried bologna with cheese, and grilled Italian sausage. Soups include chili, bean soup, and vegetable beef soup (when available). Snacks include chips, pretzels, pork rinds and the like, as well as some candy bars. The most expensive thing on the food menu is the $6 double cheeseburger, and they have a reasonable selection of beers. Not being a beer drinker, I will let others address that. Mark ordered the Chili as we waited for our entire party to arrive. I soon realized that this place is likely not geared for volume, so encouraged the early attendees to place there order before the others arrived. Everyone had a hamburger, some opting for the double, while others settled for the single. The burger is a simple 1/4 pound patty on a standard grocery store bun with the options of lettuce, pickle and mayonnaise. Here is the single served in a paper basket. For those with a larger appetite, there is the double. As far as sides, you are limited to a bag of chips, or other salty snack. I’ve already admitted that the sides are important for me, so this was definitely a negative, but I can appreciate the simplicity of what Herb and Thelma’s offers. 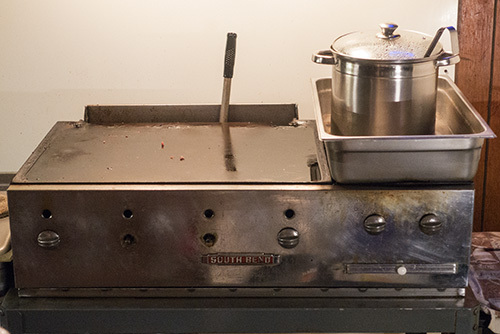 To add a fryer for fries and/or onion rings would add a level of complexity that would take away from the place. I didn’t ask, but it seems obvious that this is a fresh ground-beef burger. It is cooked on an ancient flat-top. This really is the star of the place for me. As you can see, not a big place to cook. but man does it turn out a tasty burger. I really like this burger. It reminds me of the simplicity of the Zip’s burger. 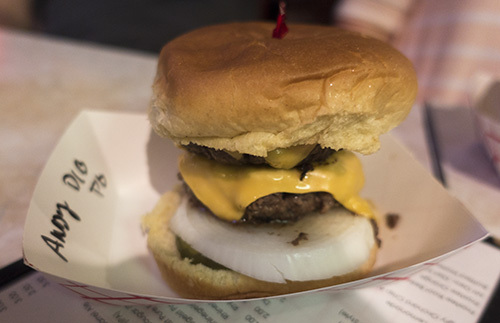 I don’t know if it was just the luck of the draw that night, but the sliced white onion on the burger was awesome. I went with the single. and most who went for the double felt the burger/bun ratio did not work well. That didn’t stop Mark and Andy from splitting a single after eating their doubles, but I think if a single is not enough for you, you should consider just getting 2 singles rather than a double. Across the board this gets a Recommend. The only qualification was the observation from Mark that you should target small groups. There is not a lot of seating available, and the these are not fast food hamburgers.